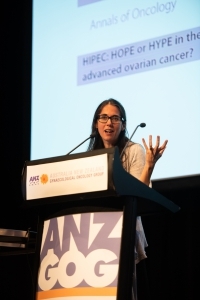 The 2019 Annual Scientific Meeting took place at the Sofitel Sydney Wentworth from 20th to 23rd March, inspired by the theme ‘Radical Treatments for Gynaecological Cancers: hope or hype’. With 260 delegates, this was the largest ANZGOG ASM to date. 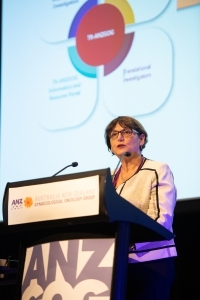 The ANZGOG ASM provides the ultimate opportunity for researchers, clinicians, nurses and clinical research officers with an interest in gynaecological cancer to hear about the extraordinary research being generated by ANZGOG and local and international collaborators, to build collaborations with other members of diverse expertise, and to present new research concepts for review by relevant leaders. Professor Christina Fotopoulou – Consultant Gynaecological Oncologist from Imperial College London Healthcare Trust, UK, gave the first plenary presentation on the evolution of surgery in gynaecological cancer over the last decades. This was a fascinating overview of the endeavour towards optimal surgical treatment without compromising patient safety and explained a paradigm shift towards increased radicality in ovarian cancer despite an overall trend of decreased radicality in other settings. Dr Umesh Mahantshetty – Radiation Oncologist from Tata Memorial Centre, Mumbai, India, presented an update of the challenges in the treatment of gynaecological cancer from a Radiation Oncologist’s perspective. Recently published clinical trial results involving neo-adjuvant chemotherapy and chemoradiation, image guided brachytherapy and reirradiation were presented, together with ongoing studies addressing challenges related to cervical, endometrial and vaginal cancers. A special thanks to Professor Anna de Fazio – Chair, Translational Cancer Research at the Centre for Cancer Research, Westmead Institute Medical Research, Sydney, who graciously accepted the invitation to speak at short notice following the inability of Dr Elise Kohn to attend due to family health reasons. Prof de Fazio gave an insightful presentation from her experience in precision treatment in ovarian cancer including the challenges, current related trials and proposals for future directions. Other presentation highlights included sessions on HIPEC for ovarian cancer, controversies in gynaecological cancer and quality and survivorship. One of the main outcomes from the meeting was the unquestionable spirit of collaboration. Through exceptional presentations, specialised workshops and networking events, this year’s ASM fostered exciting discussion resulting in an unprecedented degree of new research concepts. The conference dinner was a highlight where clinicians, consumers, researchers and operational staff alike enjoyed a wonderful dinner, a trip down memory lane through a history of ANZGOG presentation, a sneak preview to ANZGOG’s exciting new branding, followed by a well-deserved break on the dance floor! ANZGOG would like to thank Associate Professor Paul Cohen and his ASM steering committee for the enormous effort in preparing the extraordinary scientific program, and to YRD for their overall management of the event. Thank you to all the speakers, session chairs and poster presenters for their outstanding presentations. Lastly, thank you to every delegate for their contribution to make this year’s ASM such a successful event. 2020 marks ANZGOG’s 20th anniversary and the ASM in Melbourne promises to be a fantastic occasion, so make sure to save the date!